Slaw is perfect for a crowd and perfect for pairing with a variety of proteins, especially ones prepared on the grilled. One of the reasons it's ideal for a large amount of people; Cabbage. 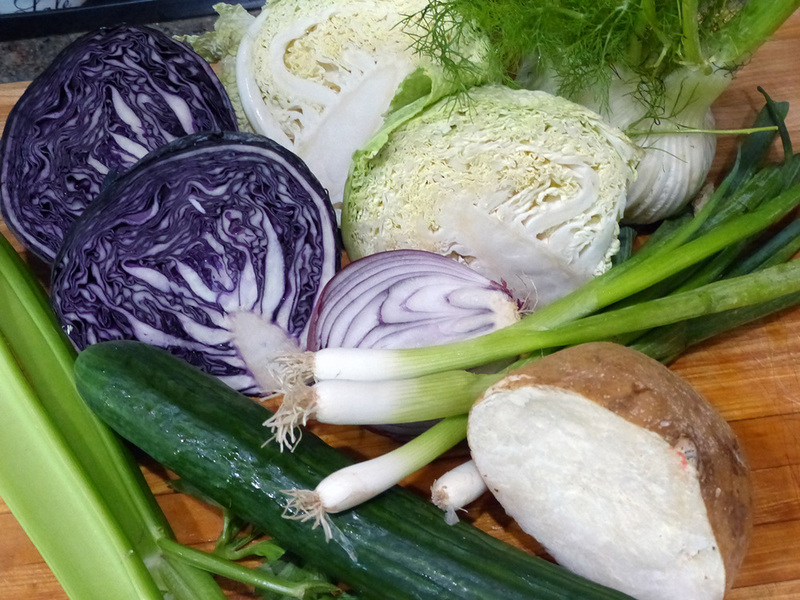 Since it is the base for slaw, the sheer density of this cruciferous veg creates a huge volume. Next best thing, if you not making it for a crowd, is it's ideal to chop it all up once over the weekend and have extra batches all week long as side dish for lunches or dinners. The reason I stated 3+ ways is that for years now, I have been making various versions of this spicy crunch slaw depending on what is fresh and crisp at the store and which dressing I stir up that day. The important factor to this slaw is finding items with great crunch factor, and then pairing it with the dressing you like or best goes with your meal. This version's line up of crunchy crunch veggies. Each trying to out crunch the next. Slices of celery, thin enough to mingle but thick enough to provide crunch. Raw red onion provides a bit of a spicy bite. Use the base dressing recipe above using less oil then add mayo or a smashed avocado to it. 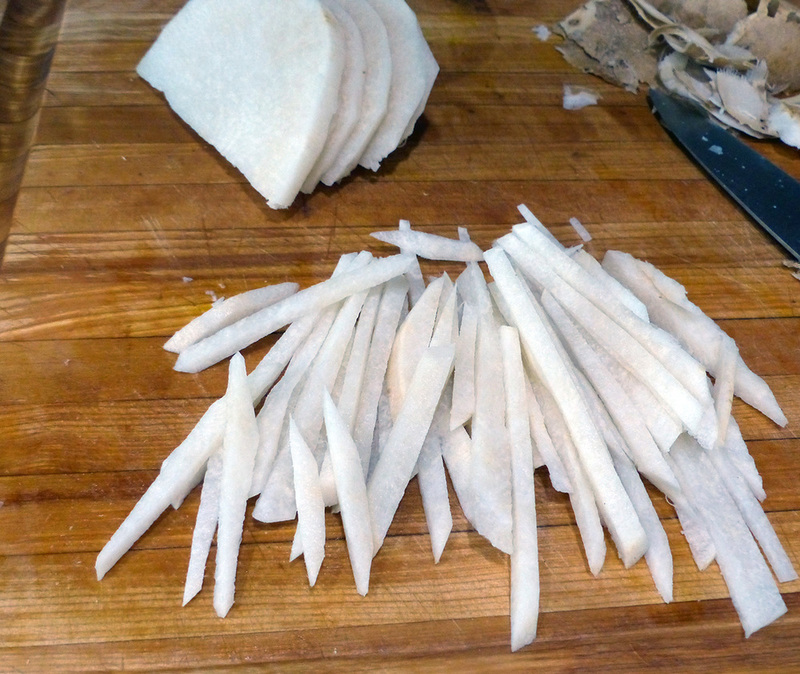 Chop, slice, cut the vegetables in thin slices. I usually use a mandolin because it's fast and easy giving you consistent cuts. But a knife does the trick too. Another important note when slicing and chopping is to make the pieces similar. Harder crunchier veg should be thinner than ones that are not, ie: cucumber can be a thicker cut. Toss all the cut ingredients with the dressing of our choice and set in the refrigerator for 1/2 hour before serving. It's better when the dressing breaks down the rawness of the veggies ever so slightly and allows the salad to absorb that spice. As I mentioned above, the crunch factor is what you are looking for here. With the dozens of times I have prepared this salad, I have altered it according to what is fresh or in season switching out the dressings too. Below are several ingredients that I have used in the past that crunch nicely with, or can replace some of the ingredients above plus two other dressing options. I do recommend that you keep the cabbage as one of the mainstays in this salad. As you can see, the possibilities for creating a crunchy slaw are entirely up to you. It can be different every time and still be full of spicy flavor. Hey, if you don't like spice, just leave it out. This salad gets better the next day, and because it's so crunchy it last several days. However, be forewarned, you might not have leftovers! So whichever ingredient mix you choose, Crunch away!